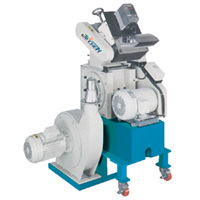 Crushing Machines- Roll-Conveyed granulator(JAR Series) - Sinchung(Jachen) Technology Co., Ltd.
JACHEN JAR series Crushing Machines are specializes in widely size of sheet material, waste, film, thermosetting edges, and rejects material. The operation of roll-conveyed crusher machine takes using of auto drag unit (with adjustable roller speed) to input the material. After recycled; the crushing material to store in the cyclone. Then crusher hereby the fixed proportion to mix with the material become recycle system. This system is easy to handle for operators and each flow path is designed to reduce the operation cost and waste yield. Recycled material enforce the film to the auto loader and then instant recycling. Easy access to screen and cutting chamber for cleaning. Access to the rotor and stator knives is simple with the divided cutting chamber which can be opened manually. All machine housing are manufacturered in a horizontal or diagonally divide robust steel weld housing. Rotor shaft in high quality steel mounted on external roller bearing, full sealed and separate from the cutting chamber. Each granulator can be fitted with blower and cyclong for scrap removal.